UPDATED: Yamaha's firmware fix for 2009 AV receiver range goes live | What Hi-Fi? Owners of the receiver can access it from the company's download site, along with updates for all the '65-series receivers. 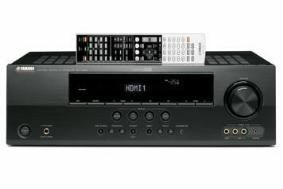 Posted 15.08.09: Owners of Yamaha's RX-V465, RX-V565 and RX-V765 AV receivers can now download a firmware fix enabling them to select a digital audio input when connecting Sky+HD and other set-top boxes via HDMI. The fix is now available at Yamaha's download site. It's required because Sky+HD boxes only deliver stereo sound via HDMI, with Dolby Digital surround only available via optical or electrical digital feeds, depending on the model of box used. Without the fix, the receivers wouldn't let a secondary digital input override the HDMI audio input. For the full background on the fix, see our past news coverage below. Posted July 15, 2009: Earlier this month we reported on a problem with Yamaha's 2009 range of AV receivers, which wouldn't work in all configurations with Sky HD, BT Vision and Tiscali set-top boxes. Yamaha has today confirmed that it will be possible to update the models affected via the digital coaxial/optical inputs or USB. This fix will enable them to handle video using HDMI and Dolby Digital 5.1 audio via a digital optical connection simultaneously. The models in question are the RX-V465, RX-V565, RX-V765 and RX-V1065. The firmware fix for the first three models will be released during August. Owners will be able to download the fix from Yamaha's website and burn it to a CD-ROM. They can then upgrade the firmware by playing the disc in a DVD player connected to the AV amp using an optical or coaxial digital connection. In the case of the RX-V1065 model, the new firmware is due for release in September. Users will be able to download the firmware upgrade from the Yamaha website to a USB stick, and then implement the upgrade by connecting it to the USB socket on the RX-V1065. Alternatively, owners and dealers will have the option of requesting a CD-ROM pre-installed with the firmware upgrade from Yamaha UK's service department. We'll be reviewing the Yamaha RX-V765 in the September issue of What Hi-Fi? Sound and Vision, on sale July 29th.